This entry was posted on Monday, August 20th, 2007 at 10:19 am	and is filed under . You can follow any responses to this entry through the RSS 2.0 feed. Both comments and pings are currently closed. Cuteness personified. Does he also own a pair of lederhosen? Lol! I love Bryan’s comment. We have a boy who’s about 5 weeks younger than Hank, and the “Chauncy” issue is constant between my husband and me. Keep up the good work! If you keep putting him in outfits like that, he may dress all Chauncy for a lifetime. I don’t know, I agree with Bryan. That outfit is cute, but just wrong. Baby inside of outfit is quite adorable though. Did it come with a matching potholder? Bryan is right. Even without reading the exchange I though, oh Maggie…this is the kind of thing my mother did to me and I hated. Let’s just say we were quite Chancy when young, especially around Easter. Bryan should dress him next in jeans and miller light tee shirt to balance the karma. Doily for a blanket maybe? It’s cute but yeah, I gotta go with the husband on this one, sorry. Hank will probably say the same when he’s older and you’re showing this to his girlfriend. It’s a multitasker – when he grows out of it, you can sew up the legholes, crochet on a couple of straps, and use it as a plant hanger. Or cut off the chest flap, leave one leg open, and voila – tea cozy. I love it! It’s so much better than the trend of dressing babies like mini-teenagers. I don’t think that babes should wear tubetops, but I saw that at the daycare I worked at! Oh I’m thinking “Photos for Stag Night”. Never mind! You have one of the cutest kids in the whole world. Just wanted you to know. Well I think he’s a stud. you must throw away that outfit and all photos of him wearing it. seriously. i’d beat myself up if i saw me wearing that as a kid. hahahahaha!!! You guys make me laugh. That sounds like something my husband would say. I think Hank looks adorable! A true recycler — making clothes out of Grandma’s old discarded afghan. On a green level, probably a good idea. On so many other levels, probably a bad idea. Squiggle was knitted such outfits with large pom poms by his grandma. I can’t wait to pull them out to show his prom date in fifteen years. You totally dressed your cute baby in Jan Brady’s purse. For. Shame. If my Grandma wasn’t already gone, I’d swear she knitted this fancy outfit herself! While I love my Grandma and most of her knitting to pieces, I will have to side w/ Bryan. i say go for it. as you said, you only have a limited time to get away with stuff like this. my most embarassing photos are actually old school photos where i dressed myself! preteen=experimenting…. Oh Sweet Jebus, he has got to be one of the cutest kids on the planet, but seriously? He seriously looks like he’s going to put a feather in his cap and break out into some kind of slapping dance any minute now :). HA! laughing so hard at Bryan, and at Kriss, whom I agree with wholeheartedly. Actually, I think I just delurked in order to say that. he looks like a potholder! I was just thinking how awful, poor Hank will be haunted by it for years to come when his friends are old enough to use Google images… then I read the comments… too priceless. Um… he looks to be very in touch with his feminine side? My husband would divorce me if I’d ever put my son in that. I would call DSS on myself. Ooh! In our house, this is called Fancy Lad wear. I love how Hank’s like “that’s right, I’m all Chauncy” in this photo. Adorable. Um, No… On so many levels. This is the exact reason that I want to have children (well, that and the whole “pass on my love and accumulated knowledge to a future generation” thing). I wish my parents had dressed me in more Chauncy outfits when I was growing up. Regardless, Hank is so cute that he can rock any outfit. ah well, all parents mess up their kids somehow. might as well be this. It’s a good thing he is aggressive. Okay, I’m really embarrassed to ask this, but who’s this Chauncy? I’m all for dressing boys like Little Lord Faunterloy from time to time, but this particular creation is really freaking ugly. I’m reminded of the plaid jumpers with frilly blouses my mother kept in my closet during my entire childhood, always hoping I’d suddenly have a change of heart and wear that instead of my signature jeans and t-shirts. First of the future blackmail pictures. You gotta have something around to show the fiancee, right? So she can coo and he can blush. This is so many levels of wrong. But his socks are groovy. Just too cute for words!!!!! He will SO NOT APPRECIATE this when he’s older. The best part of the outfit is his socks. As a mom of 4 boys, I’ll say that your days of outfits like this are limited… so enjoy yourself. I say go for it while you can, sister. I relished those early months of dressing my little guy in terrycloth duck suits and whatnot. Those days were fleeting. At some point, my husband took over and now Sam’s all hoodies and camo cargo pants. Which are cute and all, but still… sigh. Ok, so, wow. I’m not sure “cute” is the word I’d go with. But, really, what is the point of having a little one if you can’t plot his future humiliation for your own amusement? I love the idea. If the kid’s anything like you and Bryan, he’ll be able to take it in stride. One day. Oh man, I have to give it to Bryan on this one. 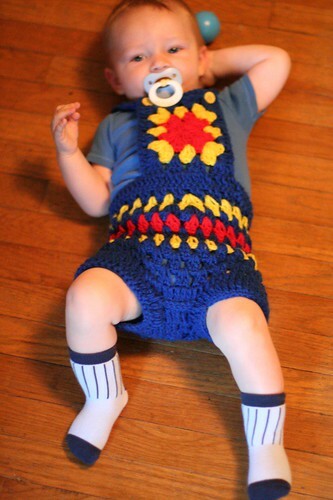 ADORABLE baby… bad outfit. Please tell me you didn’t PAY for that outfit. I crochet, and that makes ME embarrassed. I actually came to your blog for the first time to tell you how much I LOVE your book: “No One Cares What You Had for Lunch 100 Ideas for Your Blog.” It is so well written, a fast read that instantly gives you millions of ideas all at once to blog about. I had to keep a notebook with me for extra notes. Congratulations on a great book! I think you should write a sequel! Love your blog will definitely be back!